One of God's pH Miracle Foods - Lemons! My plan was to write an article about lemons that included such things as "Did you know fresh lemons are acidic pre-digestively and create an alkaline ash post digestively?" Unlike other citrus, lemon and lime do not have sugar, as they process through the digestive system they create a high alkaline ash. From my experience, lemons appear to soften the gunk that builds up in your organs and allows it to flush through. How this is accomplished is beyond me scientifically, just years of experience tell me it is in fact true. Not to mention that just recently fresh lemon juice is being touted by some Naturopath's as a great passive organ cleanse, some specifically pointing at the liver. My experience has been with the right lifestyle steps, we can re-energize our bladders using lemon (yes I did say that without saying incontinence), our prostates will benefit (well at least the men of the group), kidneys, galbladder, and more. Hydration: Lemon has phytochemicals (nutrition) that our body craves, even if don't particularly like lemons and limes, as you begin drinking it (light ratio of juice to water), you will find your body begins to crave it. We are supposed to receive minerals from our food and our water. Today the water is so degraded there is very little (if any) nutrition in the water. When we drink water our body should hold onto the water, break down the molecula structure as it absorbs the nutrition. If our body is too acidic or not performing as it should water will go straight through, meaning we drink it and less than an hour goes by and we urinate. When we add lemon or lime to our water, our body has phytochemical nutrition. During the process of holding onto the water to absorb this nutrition, our body has MORE TIME to break down the molecula structure and hydrate our cells. We have 20 different cell sizes, if we don't breakdown our water small enough, our cells cannot hydrate, thus urination right after drinking. In combination with the correct hydration, good cold pressed oils, fresh lemon and lime are very results driven. Without a doubt I believe lemon is foundational, and truly one of God's Miracle Foods in "We are what we eat!" Checkout My "7Day Food/Hydration Challenge"! Having said all that, I can tell you that without a lemon jucier I wouldn't make all the lemonade/limeade that I do, nor would I be adding fresh lemon juice to dressings, over food, etc. I believe the best lemon juicer is CitriStar, my countertop friend (and I only have 3), small footprint, dynamic, easy to clean, and makes use of the entire lemon, even by those without much strength in their hands. Works wonderful when you make as much lemonade as we do! Along the way, I ran into the article below and decided to share it with you in it's entirety. I couldn't say it better! Remember "Small Changes Make A Big Difference"! Click here for most comprehensive pure water solutions available today, for every budget and need! No More Bottled Water and at a big savings! Extracted Article Years Ago from EMR Labs - Ann Heustad, R.N. "After visiting some friends recently who drank copious amounts of water spiked with fresh organic limes and lemons from trees in their yard and freely offered this delicious concoction to all their guests, the following article reminded me of the value of our mutual dedication to planetary health and wellness through simple healthful remedies. There are basic lifestyle habits that are important to incorporate into your daily life, and this is certainly one of them. However, we are talking about organic lemons that are tree ripened. If you are buying commercial lemons from the store, learn kinesiology and muscle test the lemons you buy so that you know one way or another whether the lemons you are purchasing are actually therapeutic for you." To explain further, an ion is part of a molecule con-atom or a group of atoms that carry an electrical charge. Ions which carry positive charges are “cations.” Lemons are considered to be anionic, having more electrons (negatively charged ions) of energy as compared to cations (positively charged ions) in their atomic structure. Saliva, hydrochloric acid, bile and the stomach's other digestive juices are also anionic. In the above book, Dr. Beddoe also cites an article by Dr. Michael Lesser on the medical promise of citric acid in “Anabolism, Journal of Preventive Medicine.” He uses this article to validate the value of using fresh lemon juice daily: “It appears that citric acid, the major carrier of biochemicals in the body's energy system, shows important promise, primarily because of its excellent properties as a chelator. For sore throat, dilute lemon juice with water and gargle frequently. Dilute one-half lemon juice with one-half water. It is even better to use straight lemon juice. A slice of lemon bound over a corn overnight will greatly relieve the pain. A slice of lemon bound over a felon [pus formation on a finger joint] will not fail to bring the pus to the surface where it can be easily removed. To relieve asthma, take a tablespoon of lemon juice one hour before each meal. For liver complaints, the juice of the lemon should be taken in a glass of hot water one hour before breakfast every morning. To break up la grippe [flu or influenza], drink a large glass of hot water with the juice of a lemon added, while at the same time have the feet in a deep bucket or other vessel of water with mustard added to it. The water should be deep enough to where it comes nearly up to the knees. Keep adding hot water to the patient's tolerance and until the patient begins to perspire freely (about 20-30 minutes). Be sure there is no draft on the person while this is done. The patient should be near a bed so he can get in it easily and avoid any danger of getting chilled. If convenient, a full hot bathtub would be good in place of the foot-bath. The lemon water should be taken every hour until the patient feels that all the symptoms of the cold are gone. A teaspoon of lemon juice in half a glass of water relieves heartburn. For rheumatism, one or two ounces of lemon juice diluted in water should be taken three times a day: one hour before meals and at bedtime. In cases of hemorrhage, lemon juice diluted in water and taken as cold as possible will stop it. Scurvy is treated by giving one to two ounces of lemon juice diluted with water every two to four hours. In excessive menstruation the juice of three to four lemons a day will help check it. 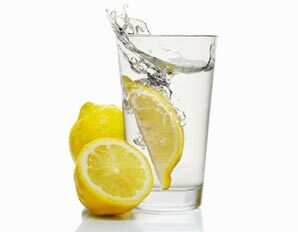 Best to take the juice of one lemon at a time in a glass of cold water.